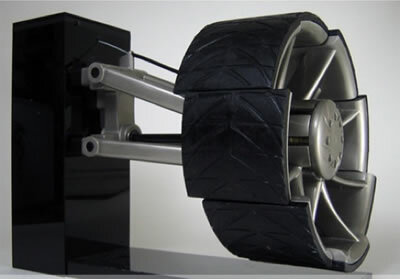 The Dynamic Augmented Wheel System eight-part wheel is actually a working prototype of an interesting idea; that a car can take a turn better if the wheels lean in segments. The DAWS segments are guided by a magnetic rail on the inside that holds the wheel in place while driving straight, then moves to let it shift with the car's center of gravity in a turn. Although I'm always ready to applaud the unusual idea, it's not clear to me why this kind of elaborate machine will do any better than a wheel with negative camber. As far as I know. all modern cars use suspension systems that do this in a turn. However, I'm still liking this prototype because it reminds me of the cool (and as yet unattainable) smartwheels from Neal Stephenson's 1992 novel Snow Crash. Smartwheels use sonar, laser range finding and millimeter wave radar to identify mufflers and other debris. Each one consists of a hub with many tiny spokes. Each spoke telescopes into five sections. On the end is a squat foot, rubber tread on the bottom, swiveling on a ball joint. As the wheel rolls, the feet plant themselves one at a time, almost glomming into one continuous tire. If you surf over a bump, the spokes contract to roll over it. If you surf over a pothole, the rubber prongs probe its asphalt depths. From Jalopnik and Yanko; thanks to Zac Hunter for pointing this one out.